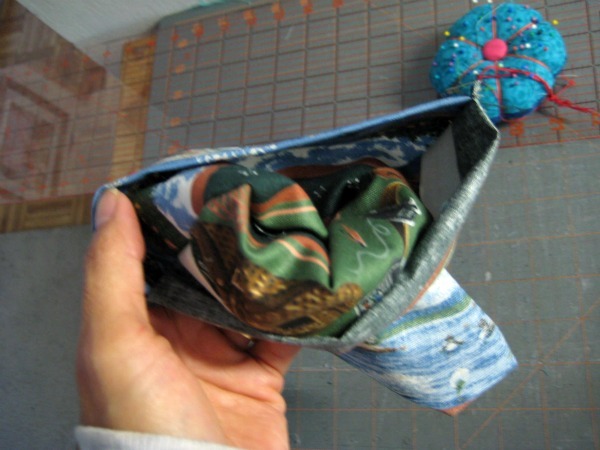 I’ve written about fabric wraps and snack bags before. This morning I had quite a bit of time to myself, being the weekend and all, so I took some time to find something to guide me in making fabric sandwich bags. I’m going to link this to Making Monday Marvelous at C.R.A.F.T. (love that site). Angry Chicken had an excellent video to make your own reusable snack bags. If you do not have 5 minutes to watch it (and she is funny, so I recommend viewing it), here are my notes. About the size. 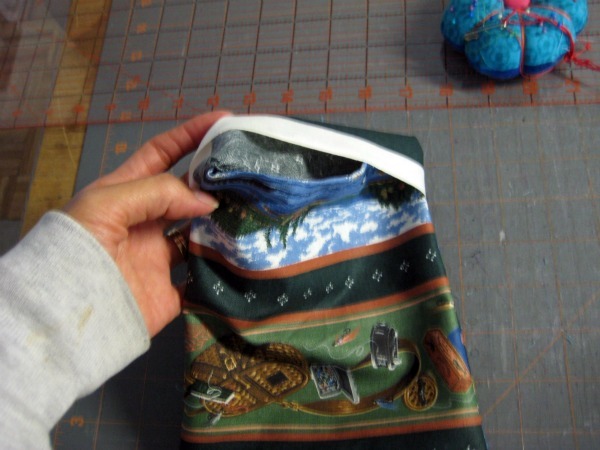 I made up bags using widths of 6 1/2″ and 6″ but they are smaller than commercial bags. I think 6 3/4″ would match a purchased bag. And sometimes you just don’t care, so do what works for you. 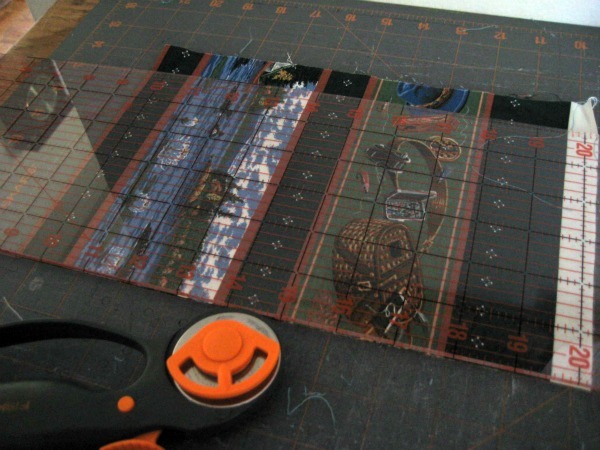 My rotary cutter and mat are the bomb. Unlike the Wrap-n-mat, I am not using plastic. I am guessing that these bags will cause bread to dry out, but that could be solved by adding a layer of plastic or fabric. Or pack non-moist food, like crackers and pretzels. 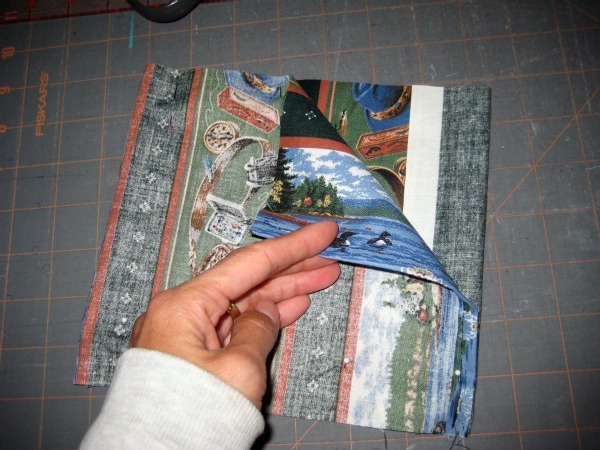 Taking Amy at Angry Chicken’s lead, I folded the flap to 1 1/2″ (I tried 2″ and feel that it was too deep) on one short end of the rectangle; the other end I folded to meet the flap. Then I pinned the sides. Both ends folded and sides mostly pinned. Sewing up the sides takes about one minute total with a straight stitch. 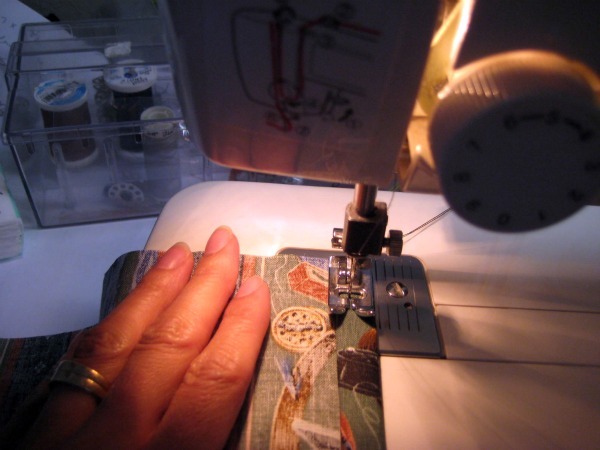 I followed the straight stitch with a zigzag stitch to lock in the raw edges. Alternatively, I could have pinked the edges, or used a serger (if I had one). Or since the bags are not for show, leave them unfinished. I forgot to say that I hemmed the short ends. 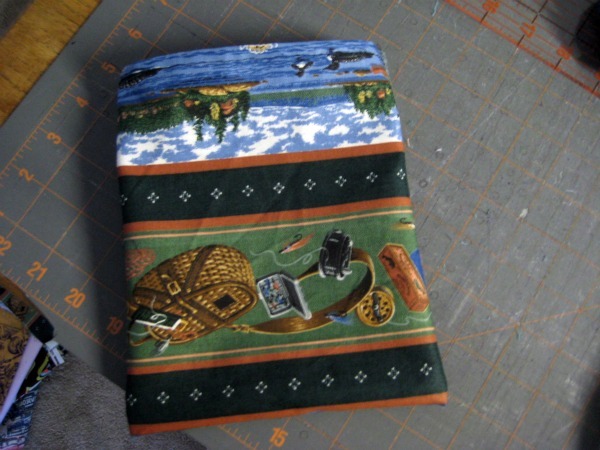 Once the sides were sewn, I turned the bag right side out. You will smile when you see the pattern on this scrap. 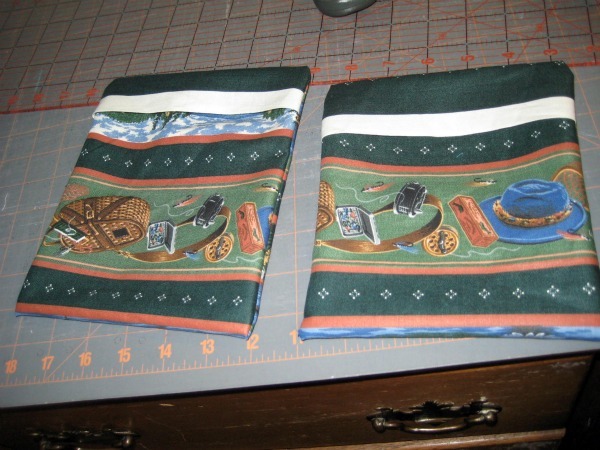 I am guessing that this fly fishing fabric came from a church rummage sale. That is last place I remember buying fabric. I shop rummage sales less than once a year, so I must have been browsing while I waited for the younger three kids to finish their own shopping. Right side out and ready to fill. Before ziploc bags were invented, we used sandwich bags, with a flap. If there was no flap, we used wire twist ties. This bag has a flap and it stays better than the plastic flaps ever did. Bringing the flap to the front. Done in less than ten minutes! Do you remember fold-over sandwich bags? This entry was posted in crafting and tagged fabric sandwich bags. Bookmark the permalink.